"The Army was my life. These leaders, they almost destroyed me," said Command Sgt. Maj. Teresa L. King of her removal from her commandant post. COLUMBIA, S.C. — When Command Sgt. Maj. Teresa L. King was named the first female commandant of the Army’s elite drill sergeant school in 2009, proponents of gender equality in the military hailed the news as a watershed. But it did not take long for the grumbling to start. Students who flunked out of the school complained that she set unfair standards. Some of her own instructors said she rigidly enforced old-fashioned rules. Traditionalists across the service asked: how could a woman with no experience in combat manage the Army’s only school for training the trainers who prepare recruits for war? She says she tried to ignore the criticism, but her superiors did not. Last November, they suspended Sergeant Major King, forbidding contact with students or staff and opening an investigation into what they called the “toxic” environment at the school. As that review dragged on, she says she felt like a criminal: isolated, publicly humiliated and so despondent that friends worried that she might hurt herself. Last week she decided to fight back, filing a complaint with the Army asserting that her male supervisors had mistreated her because she is a woman, and asking for a Congressional investigation. Four days later, the Army reinstated her, saying that the accusations against her — including that she had abused her power — could not be substantiated. Now, just a week from the scheduled end of her tour as commandant of the school, located here at Fort Jackson, and three months from mandatory retirement, Sergeant Major King, 50, is making clear that she is not ready to go quietly. In an interview this week, she described what she says was a yearlong campaign by two superiors — a command sergeant major based in Virginia and his boss, a major general — to undermine her authority and encourage her drill instructors to turn against her. Sergeant Major King’s direct supervisor, Command Sgt. Maj. John R. Calpena, was traveling on Thursday and was not available for comment. Maj. Gen. Richard C. Longo, the former head of Initial Military Training for the Army, now deployed to Afghanistan, declined to be interviewed, citing Sergeant Major King’s legal action, known as an Article 138 complaint. To her supporters, Sergeant Major King’s case underscores how difficult it remains for even the toughest of women to ascend into high-profile jobs in the Army, where combat experience remains the essential currency. Because women cannot serve in combat, they are automatically handicapped in establishing their leadership bona fides, her supporters say. 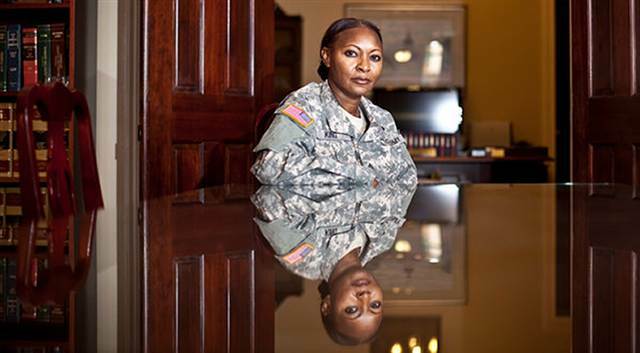 Her critics assert that Sergeant Major King, who spent the last decade mainly in training jobs on domestic bases, should at least have deployed to Iraq or Afghanistan with a noncombat support unit. But she argues that if she had, she would not have gained much experience useful to training drill sergeants. Small, wiry and intense, Sergeant Major King does not seem the type to shout discrimination easily. The daughter of a North Carolina sharecropper, with 31 years in uniform, she thrived like few other women in the Army, earning top scores in fitness tests and evaluations, and becoming an unabashed expert in the minutia of Army regulations. Divorced and without children, she called the Army her family, and bore her nickname, No Slack, proudly. As commandant, Sergeant Major King recruited high-performing drill sergeants from training bases like Fort Benning, Ga., and Fort Leonard Wood, Mo., to be teachers at Fort Jackson, then oversaw the rigorous 10-week course that produces new drill sergeants. In her first months, she was pushed by her commander then, Lt. Gen. Mark P. Hertling, to methodically enforce basic standards on everything from body fat to rifle handling, which he felt had declined. She ordered her staff to reject candidates who were even slightly overweight or unfit and to reprimand instructors for infractions like discourteous behavior and wearing their hair too long. The failure rate for drill-instructor recruits rose. But as soon as General Hertling transferred to become head of Army forces in Europe in early 2011, things changed. “It was like a duck hunt,” said Sgt. Maj. Robert Maggard, Sergeant Major King’s deputy and staunchest supporter. Once treated as an equal to brigade commanders, Sergeant Major King was no longer invited to meetings regarding the school. In his first visit, General Longo told her, “I’ve been hearing bad things about you,” she said. In a subsequent visit, he had an aide tell her to avoid the cafeteria while the general dined there. In a visit last September, Sergeant Major Calpena delivered a blistering critique of Sergeant Major King’s tenure, she said, telling the staff she had been overly doctrinaire and by-the-book. She said she once even overheard Sergeant Major Calpena urging a disgruntled sergeant to file a complaint against her. “I was working 16-, 18-hour days, and Sergeant Major Calpena was running around, trying to get me relieved, sabotaging me,” she said. Sergeant Major Calpena, an Army Ranger with multiple combat deployments, announced her suspension last November in a stormy private meeting in her office. “He came in swinging,” she said, telling her she was deeply unpopular among her peers because of her unyielding style and lack of front-line experience. Sergeant Major Maggard’s wife, Barbara, would call just to hear her voice, then hang up when she answered, not speaking because of the no-contact order. On Christmas, she left presents on Sergeant Major King’s porch. In March, General Longo’s office sent a redacted version of its investigation, which contained complaints from eight sergeants, all of whom had faced disciplinary action, according to her lawyer, James E. Smith, a state legislator and member of the Army National Guard. Two later rescinded their complaints, he said. “If she had been a man, this would not have happened,” he said, noting that several recent male commandants have not had combat experience but did not face such complaints. Sergeant Major King gathered support statements from more than 45 soldiers, but no action was taken on her response until she filed the complaint. She is now asking to remain commandant for six additional months — the period she was under suspension. She also wants to stay in the Army beyond her mandatory retirement date in August. Her command has said she will be replaced on schedule, May 17. But she has implored South Carolina’s Congressional delegation to intervene. This story, "Once Hailed as Army Pioneer, Now Battling to Stay on the Job," originally appeared in The New York Times.